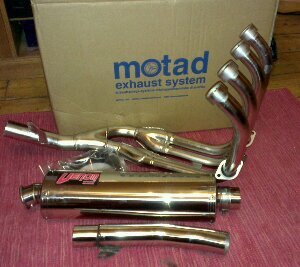 Treated myself to a set of nice new stainless steel downpipes and can from Motad. Current stock pipes have turned into complete rust bucket and full of holes at the bottom by the 4-into-1. Not bad considering they’re over 10 years old now. Will fit downpipes one upcoming weekend when weather permits. But might stick can on sooner, can’t wait to see how it sounds.